Tupperware, of all things, provides a lens on what it means to be a millennial. Millie M. Parkinson (’17) didn’t quite know what to make of it. “It just seemed so . 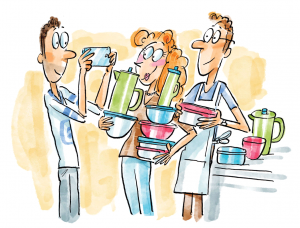 . . Napoleon Dynamite,” she says: she and two dozen college students squeezed into an apartment kitchen accented by kaleidoscopic polyethylene products, their eyes fixed on a periwinkle gadget that measures, chops, and whisks. Tupperware consultant Tricia soon had partygoers chopping, churning, and mixing—and voilà! Barbecue chicken sliders and berry ice cream. “It was impressive,” guest Seth P. Hatch (’17) says—but no, he wasn’t ready to buy any products of his own. “I had only ever seen Tupperware parties in movies set in the ’60s,” adds guest Carly A. Christiansen (’17). Turns out the parties are still happening—every 1.4 seconds somewhere in the world, according to the company. Just not so much in college towns. While Tupperware is thriving in emerging markets, twentysomethings—the millennial generation—haven’t quite latched onto the products, nor the parties, and the company recruited BYU industrial-design (ID) millennials to figure out why. The semester-long project, taken on by ID professor Bryan F. Howell’s third-year studio course, began with extensive research. One focus group snapped photos of food interactions and answered questions from the ID students via text message. Questions and prompts like “Where do you find meal ideas?” and “Describe your cupboard space” filled eight weeks of surveys and ethnographic studies. Next came the parties—like the one above. It’s the kind of research that underpins the industrial designer’s mission, says Howell. Synthesizing that research, the students made some generational discoveries they could transform into end-of-semester projects and recommendations to the company. For one, Tupperware is “plastic, which is not a millennial thing,” notes Howell. Millennials are also wired, they say—this is a generation that has mastered online self-expression, photographs their meals, and practically sleeps with their cell phones. Though the company recommends inviting guests to the parties in person or over the phone, students turned to Facebook to spread the word. “It’s what we do,” says ID student Janae L. Pettit (’17). For millennials it’s the experience that’s key, the students conclude. ID student R. Hunter Hofstrand’s (’17) project emphasized convenient designs for “taking your lunch to school or taking it camping.” Millennials also enjoy investing in products that support cause-oriented organizations, says Parkinson, who created a model for retreats where guests focus on an activity, such as bread making. The Tupperware may not be the main event, but it is used and sold in the process, with a portion of sales going to the cause. Ensure the gathering is a memorable experience, she says—not a sales pitch. Dirt under her fingernails, stars in her eyes, planetary geologist Jani Radebaugh uses Earth’s edges to understand Io.